With the swimming pool season coming to a close, Poolandspa.com offers not only inground and above ground swimming pool covers, but swimming pool cover pumps as well. These pumps are great for opening time but they can really save you at lot time in the winter months by providing a way to keep your pool cover free from snow, ice and rain this winter season. Since we offer a variety of cover pumps and cannot list them all, here are some of the premier selling swimming pool cover pumps. The Above Ground Cover Drainer, Little Giant Cover Pump and the Water Wizard Winter Cover Pump. Each of these pumps is capable of handling any amount of snow or rain that accumulates over the winter months. Why spend hours and hours in the springtime trying to pump off the cover only to have some of the dirty water spill into the pool or having to hire someone to do it for you, costing you more money than the pump is worth. 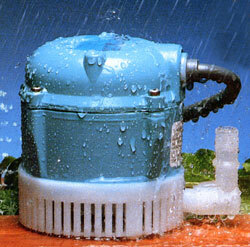 The Little Giant Cover Pump is The Original swimming pool cover pump. Little Giant has a great reputation for sewage and sump pumps but this cover pump is one of their all time best sellers. The operation of this pump is very simple. Un-package your cover pump and attach to the garden hose, place on the cover and watch it pump out all of the snow and rain that has built up over the winter. The Little Giant Cover Pump is considered the workhorse of the cover pumps. It is 100% fully submersible and it works just as well on either on above ground swimming pools or in ground swimming pools. Some of the specifications of the Little Giant Cover Pump are the water flow rate is 205 gallons of water per hour at one foot of head. The pump has a shut off of 7.4 feet. Don’t worry about spending a lot of money on electricity; this pump has the electrical requirements of 115 volts, 60 Hz, 70 watts and 1.1 amps. The horsepower on the Little Giant Cover Pump is 1/150. The power cord is 18 feet. You will get your money’s worth with this pump. Little Giant is one of the most recognized names in the pump industry. They have a solid reputation for making quality, high performance products. This cover pump has a very powerful 1/6 horsepower that can drain your swimming pool cover fast. The pump weighs about 10 pounds so it is easy to transport. 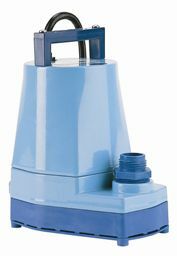 Like the Little Giant Cover Pump, the Water Wizard InGround Cover Pump is completely submersible. This pump is clog resistant so you don’t have to check on the operation so often. One of the great features of the Water Wizard Cover Pump is that it can take out water within 3/16 of an inch of the water surface. This cover pump can remove 1200 gallons per hour. It comes with a garden hose adapter and a cord. 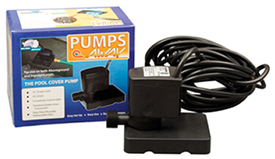 These pumps are easy to operate and they are very cost effective. Having a swimming pool is a huge investment for your home; why not treat it as such. Invest in the Water Wizard InGround Cover Pump. You will be amazed at how much time and money you save plus you are getting peace of mind during the winter. By investing in a swimming pool cover pump you are really saving money. Many swimming pool owners either leave the water for the spring or they hire someone in the winter to pump it and that can cost you a lot of money. Everyone is trying to save money these days, why not invest in a swimming pool cover pump that will prolong the life of your swimming pool cover, save you stress about worrying about the leaves and water on the cover during the winter. Plus these pumps will remove any water before it comes frozen. If you are interested in purchasing any of these swimming pool pump covers or would like to see a complete list of our inventory then visit Poolandspa.com today. With closing season approaching, one of the best things you can do for your swimming pool is to invest in one of our swimming pool cover pumps.